I was fortunate to use the Microsoft Hololens for a couple of days to experiment and prepare for a demo. Here are some practical tips for doing a demo with this device. This is a short instruction on how to use the Microsoft Hololens for demo purposes. For heavy usage with a lot of holograms, you can expect a battery life of 2,5-3 hours when fully charged. Make sure you have used the Hololens for at least 1 day before engaging in a demo. This gives you enough confidence to use the device in a demo situation. This video shows some of the basic gestures and the main menu. Scan the whole room. Make sure you walk around and scan tables and sofas from all sides. Make sure there are no people or animals walking around while scanning since they will be seen as inanimate objects. After scanning you can place some windows screens on the walls. For example some browser widows with YouTube, news and some image as a first impression. Place some holograms in the room. 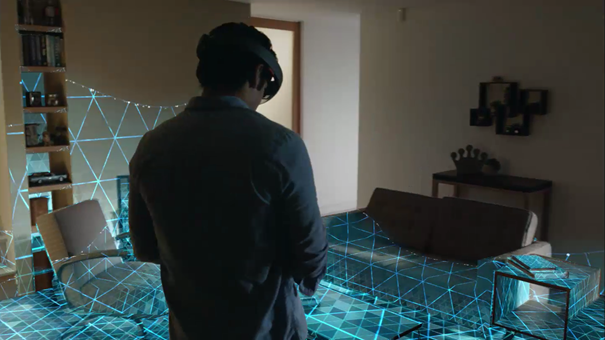 The Hololens is aware of the physical objects in the room so you are able to place objects on top of the table or sofa. You can prepare the feature Robotraid feature. Please note this game is less suitable for people with a low tolerance to violence. Actiongrams (found in the menu) are also very impressive holograms. 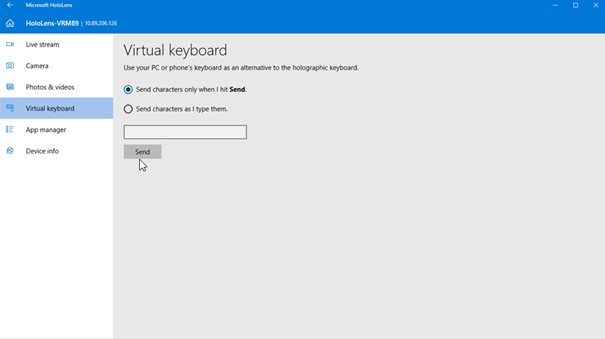 How to set up your laptop to share the screen of the Hololens. During the demo you want to share your screen with your audience. And since you are probably running the demo in a group and you do not have 20 Hololenses laying around you need to have some form of sharing your screen. This is the tricky part. If these steps are not working you need to run through them again. I experienced different behavior when connecting to an office WIFI, using an Android and an iPhone tethering (the iPhone did not work somehow). The mirroring is delayed by a couple of seconds, but it will allow other people in the same room to see what is seen by the Hololens user. Sound is also mirrored. Due to the time delay it can be a bit confusing. 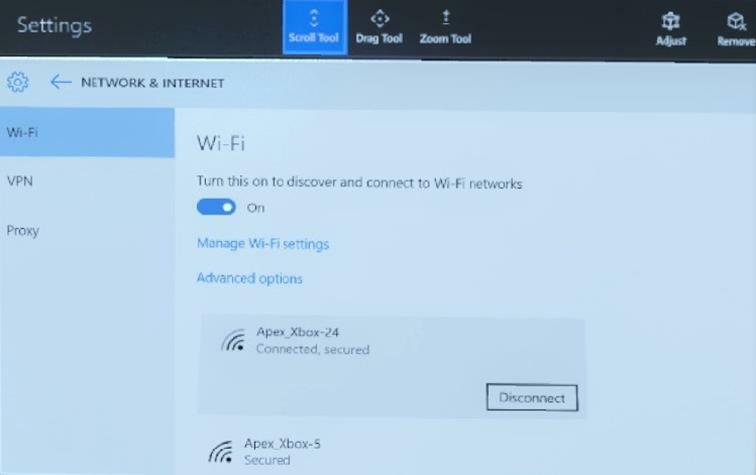 The framerate is much less than the real Hololens experience and depends on the quality of your WIFI connection. Make sure you use a high quality HDMI cable when you want to share your screen on a presenter or a big TV screen. 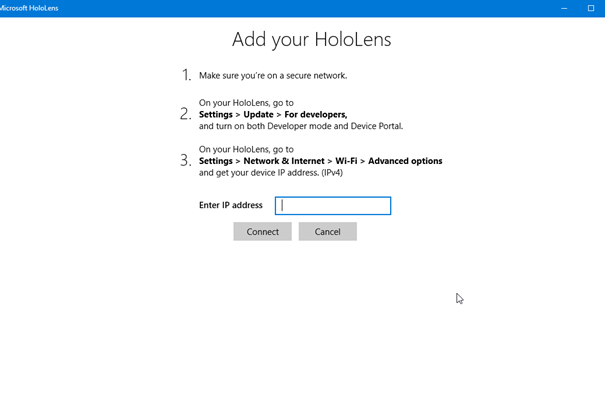 Connect your computer (Windows 10 of course) to the same WIFI network as your Hololens. Make sure it is a secure WIFI network (WEP, WPA, or WPA2) and no “open WIFI”. Download the Hololens app on your computer . This app is only available in the countries where the Hololens is sold. At the time writing these instructions the Hololens is only available in the USA. Change the localization of your Windows computer to the USA. Press the Start button and type “Country”. Change country to the USA and close this window. Now you can install the app. Gaze at the Settings tile and perform the air tap gesture. Perform a second air tap to place the app in your environment. The Settings app will launch after you place it. Scroll down and enable Device Portal. Find the IP address on the device under Settings > Network & Internet > Wi-Fi > Advanced Options. Keep this screen open to make sure that you can type this number in the Windows machine you are using for screen sharing. 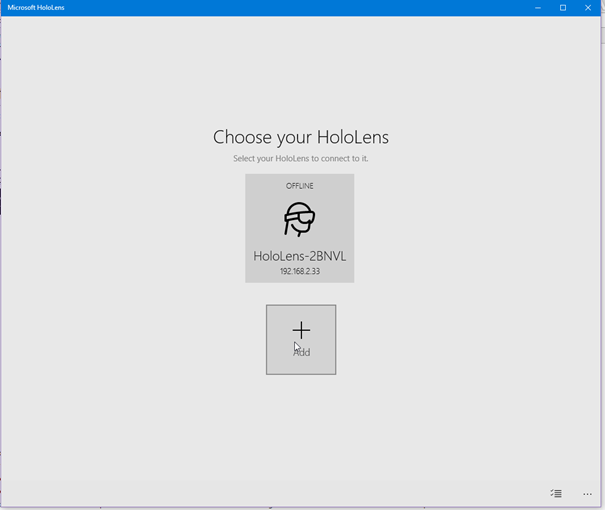 Open the Hololens app on your PC and press add. The device will display a PIN number. You can enter this number in your machine. Next you have to enter a username and password. This can be any username (does not has to be a Microsoft Account (MSA) or an account on your network). Make sure your use the same password :-). The companion app is very handy to share a live stream of the user of the device. Below are some screen shots. Some final tips for usage of the companion app. 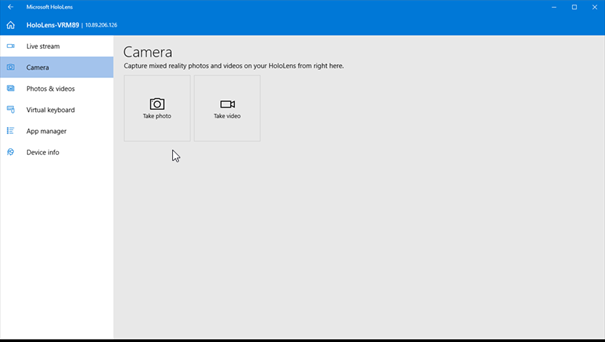 Recording video is very easy whit the command “Hey Cortana record a video”. Using live steaming you can show what the user of the Hololens is seeing. Via camera you can start a photo or video recording. In the version I was using the video recording stopped when I switched over to another tab. You can view the recorded video’s and photo’s at the next tab. I was only able to download one video at the time. The tab app manager you can use to launch apps remotely. This is a handy support for inexperienced Hololens users. EBS advanced topologies: Sharing APPL_TOP, ORACLE_HOMEs, err… heck, why don’t we share it all?